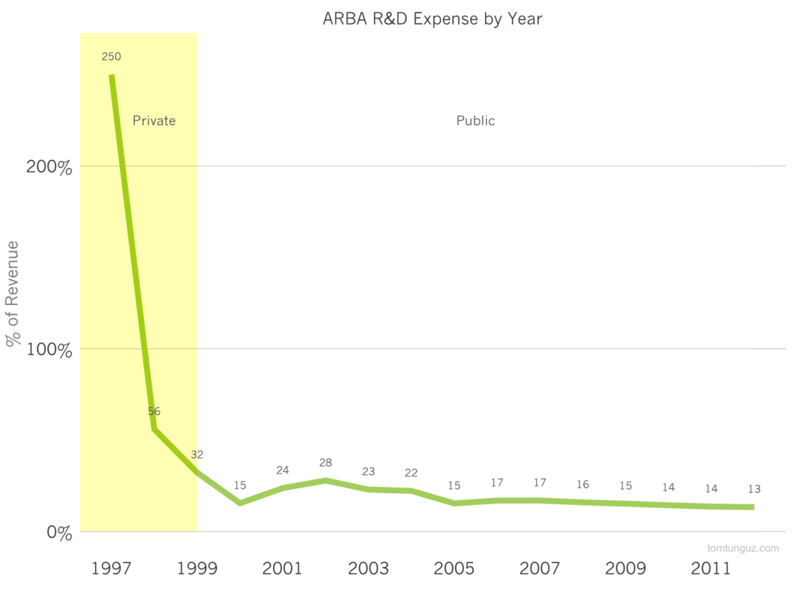 Ariba went public in 1999 three years after having been founded. In its first year of selling, the company generated $800,000 in revenue. Then it ramped. $8 million, then $45 million, then $274M. In a three-year period, the company had grown 33x and achieved an astounding CAGR of 224% over the same period. Ariba shares increased 300% on its first day of trading at IPO, valuing the company at $6 billion. At its peak, the company would be worth $40 billion, but after the dotcom crash, the share price returned from the stratosphere to normal levels. Ultimately, SAP acquired the company in 2012 for $4.6B. Before its acquisition, which was consummated at the highest historical multiple of any software company, Ariba was the largest independent procurement software business. It sold software to help businesses buy the things they need in order to operate, everything from pens to planes. In particular, Ariba sold software to run RFPs, manage contracts with suppliers, analyze corporate spending and ensure financial compliance. Another unique characteristic about the story of Ariba: the founding team was seven people. At the outset, Ariba sustained very high gross margins, in the low 80 percent range. Over time, as the company began to serve larger customers and began offering customization of their procurement software, the gross margins dipped reaching its nadir in 2006, at 46%. 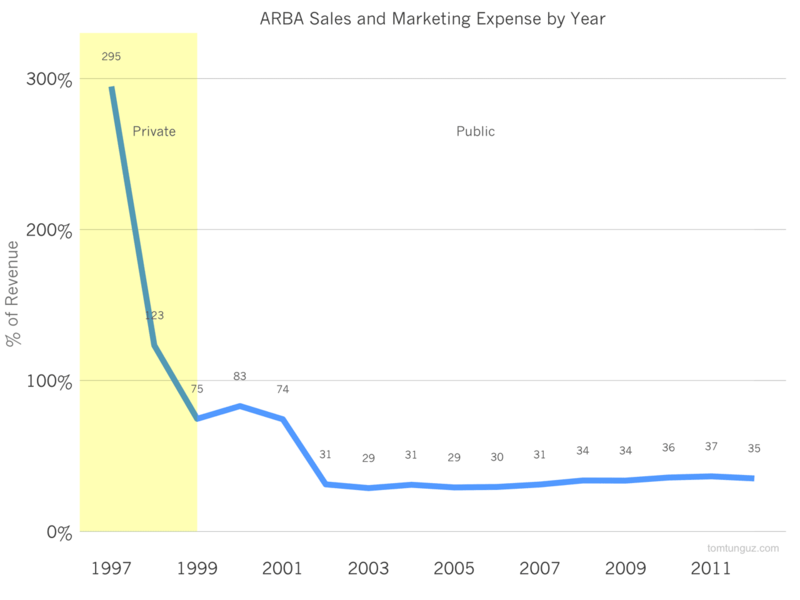 At this point in time, Ariba generated 56% of its revenue from professional services, which dramatically depressed because margins. Over time, the company would reduce professional services to about 33%. Ariba’s growth was remarkably efficient. The company spent $46.4M in sales and marketing efforts in the years before generating more than $200 million in revenue. At the time of its IPO, the company was only investing about 75% of its revenue and sales and marketing. After the company successfully completed its IPO, the company would increase its annual sales and marketing budget by 6X year-over-year to $230M and $298M in 2000 and 2001, at precisely the wrong time. The market would correct shortly thereafter. 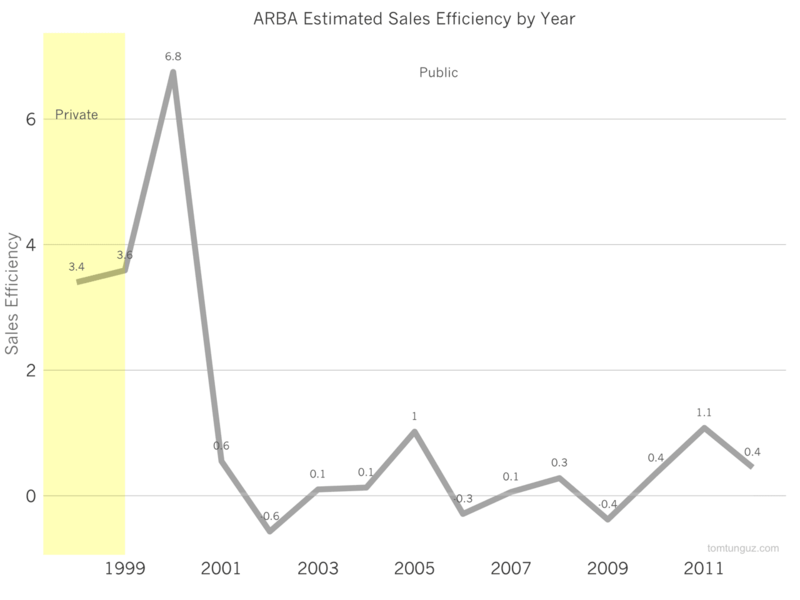 Ariba enjoyed terrific sales efficiency through its first three years. The company started to rapidly increase marketing expense in 2001, and the market fell out from underneath them, the sales efficiency dropped dramatically, and the company actually recorded a negative sales efficiency. In 2002, the company invested significantly in sales and marketing, but suffered a decline in revenue. Presumably this is due to customer churn, as a fair number of their customers must have gone out of business. 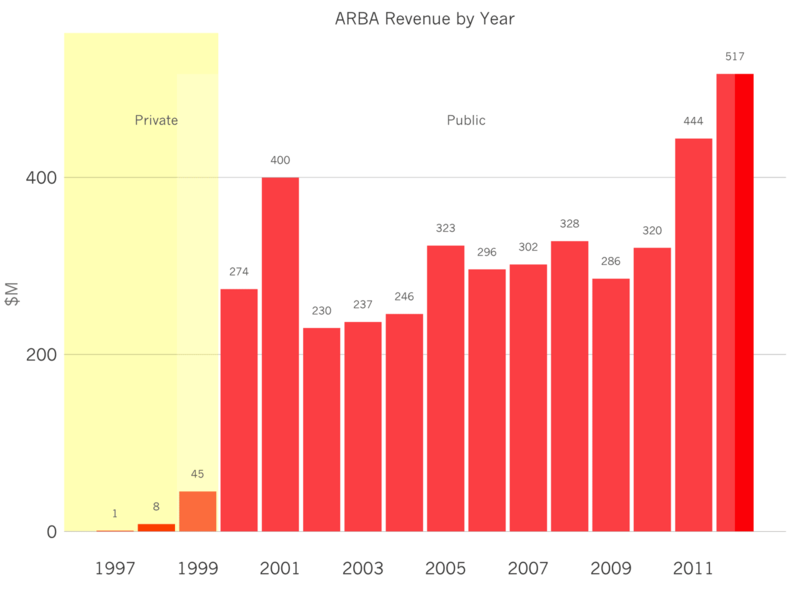 Additionally, Ariba spent relatively modest fraction of their revenue on engineering efforts. In a typical year, the company invested about 20 to 30% of their revenue in research and development. Of course, given the large size of professional services contracts, a fair amount of custom software development was completed at the behest of customers. 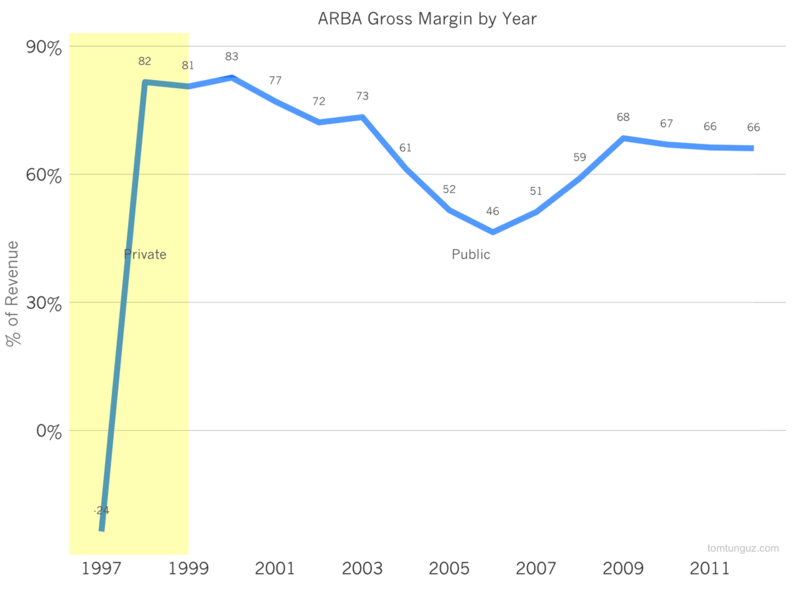 Ariba attained profitability in 2009 for the first time. But, the company has been operating at close to breakeven since 2004. 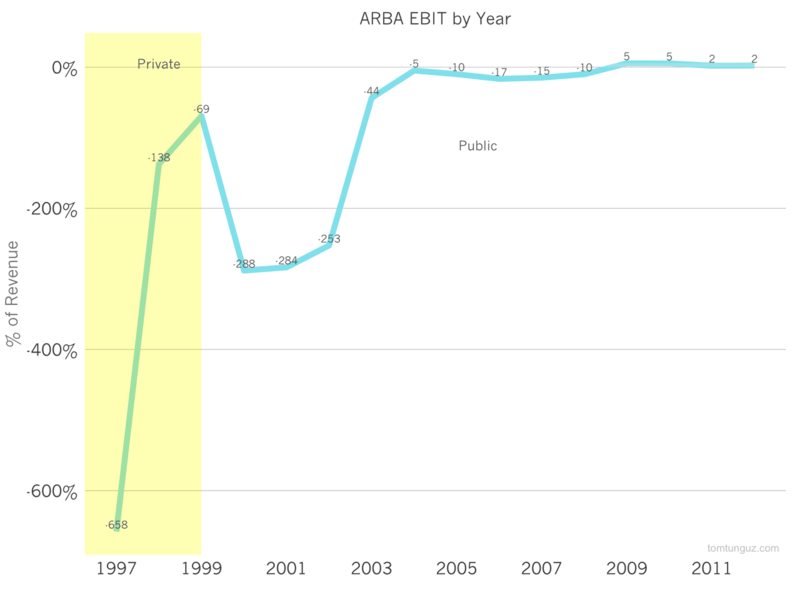 The notable dip in 2001, when Ariba notched a loss of $2.7B, or -674% net income as a percentage of revenue figure. Ariba acquired a company called Tradex technologies for $1.6B in 1999, and ultimately wrote off about $1.4B, which had to be recognized in the period from 2000 to 2002. 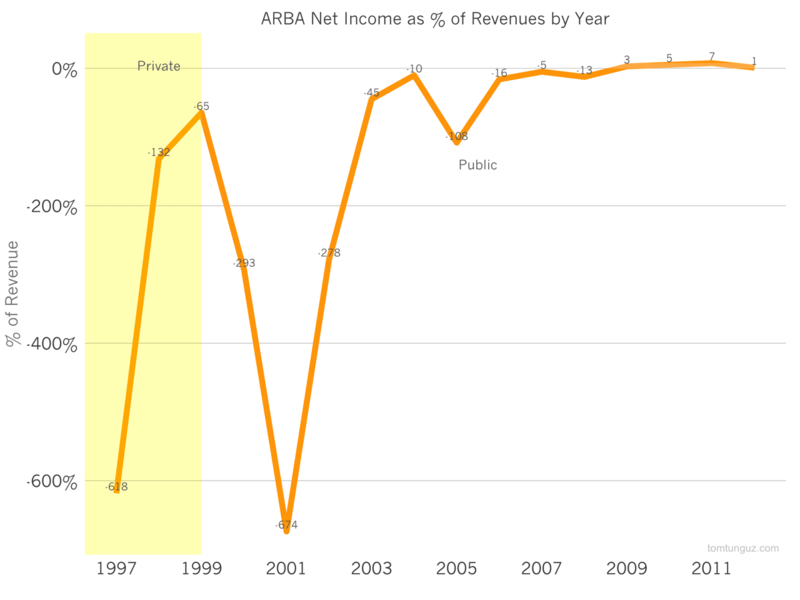 Similar to net income, Ariba sustained cash flow breakeven for the first time in 2009, but flirted with the mark since about 2004. In the end, Ariba’s team built a rocketship that grew incredibly quickly, weathered quite a bit of market turbulence, and ultimately created a lasting business that still defines the procurement industry today.